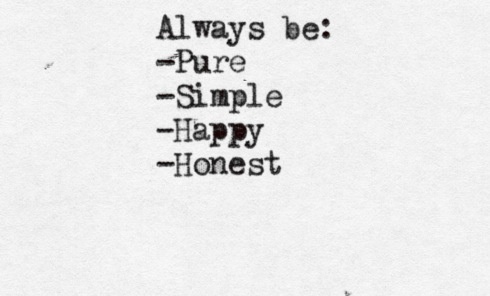 pure, simple, happy and honest. seems easy enough but it doesn’t always work out that way. honest comes easily to me, you know unless my unconscious knows something that i don’t. pure is a state of mind, and it fluctuates, as many things tend to do. hand in hand with simple, maybe you can’t have one without the other. happy is tricky, especially for me, not because i’m never happy or i think it’s impossible, but because happy to me is a mood and not a destination.